"The mobster who could be 'flipped' or 'turned,' who would continue to function inside the mob but now as a fully developed informant for us, telling us all the secrets... It’s immodest of me, but our three best, in my not-so-meek opinion, were mine: 'Romano,' 'Sporting Goods' and [Richard] Cain." But who were “Sporting Goods” and “Romano”? A careful reading of Roemer’s books, especially his memoir and his biography of Outfit boss Tony Accardo, provides compelling clues. When combined with declassified FBI reports, it appears the identities of these underworld informants can finally be revealed. Poring over Roemer’s books looking for mentions of “Sporting Goods” to build a partial profile will help to identify him. In Outfit parlance, a street boss oversaw gambling, bookmaking and other criminal activities within a territory on behalf of the organization. Some traditional Outfit territories were the South Side of Chicago, the North Side and the Loop. From Roemer’s description, there is no indication that “Sporting Goods” himself was an inducted member of the traditional organized crime group the FBI called, “La Cosa Nostra.”  In Chicago’s underworld, street bosses were not necessarily LCN members or even Italian. Some non-Italian mobsters like Murray Humphreys or Gus Alex had influence and power that surpassed that of many LCN members in the Outfit. The profile of “Sporting Goods” that emerges from these snippets is that of an older man with polish and ability. He was a tough and successful racketeer, but he was cultivated enough to form a strong bond with Roemer and his wife. “Sporting Goods” was a street boss of an unknown ethnicity. Roemer is careful not to call him Italian or an LCN member, which suggests he was neither. (This was in contrast to “Romano” who is explicitly identified as an LCN member). Roemer doesn’t provide a timeline for “Sporting Goods’” cooperation in order to protect his identity, but we can surmise based on available details. The FBI had no informant of significant value in 1965, and “Sporting Goods” died before Roemer left Chicago in 1978, for another assignment in Tucson. It has already been established that “Sporting Goods” cooperated for ten years before he died. This suggests that “Sporting Goods” began to develop as an informant about 1966-67 and died about 1976-77, before Roemer transferred. Looking at Outfit street bosses that might fit this profile, a few standout. Johnny Roselli was an important racketeer representing Outfit interests on the West Coast. He was an inducted member of LCN. Handsome and suave, he moved easily between Hollywood and the underworld. It’s possible to imagine Roemer enjoying his company. Nonetheless, he can be eliminated as a suspect since he spent most of his time outside Chicago and could not have met Roemer regularly for dinner. And his manner of death was inconsistent with “Sporting Goods”. He was the victim of a mob rubout in 1976. Dominic DiBella was boss of the North Side of Chicago for a short-time in the 1970s. A rough and tumble mobster, he had a reputation as a killer. It seems unlikely Roemer and his wife would have enjoyed his company. DiBella can also be eliminated as a suspect since he died of cancer. Two better fits are Les Kruse and Ralph Pierce, leading non-Italian members of the Chicago Outfit. Roemer’s description of “Sporting Goods” makes it more likely that he wasn’t an LCN member. Les Kruse was a gambler who oversaw Outfit rackets in the suburbs north of Chicago. Known as a “Killer Kane”, his underworld connections went back to the Al Capone-era. He worked closely with Murray Humphreys and Gus Alex to help fix politicians and judges on behalf of the Outfit. He died in 1976, at the age of 69. Ralph Pierce was the boss of the South Side of Chicago. A gambler and bookmaker, he was a close associate of all the Outfit leaders for decades. Pierce was one of the top Jewish gangsters in Chicago. He was an assigned target of former FBI agent Roemer to bring down and figured prominently in his memoir. Pierce died in 1976, after suffering a heart attack a few weeks earlier. Based on their profiles, Pierce is probably a better match than Kruse but there are no definitive clues linking “Sporting Goods” to either man. “Romano” began to cooperate about 1967, sometime after Giancana was released from jail after refusing to testify before a grand jury and relocated to Mexico. Like “Sporting Goods”, “Romano” was friendly with Roemer and his wife. To get “Romano” to open up, Roemer said he took an indirect approach. After drinks and during the meal, Roemer would bring up his area of interest. He would typically state some mob gossip as fact and wait for “Romano” to correct him and give him the Intel he was after. By “finessing” his questioning, Roemer made “Romano” feel like he wasn’t actually informing. This was a different tact than the straight-forward approach Roemer used with “Sporting Goods”, who was well-aware his conversations were being reported back to the FBI. Roemer’s hoodwinking of “Romano” caused problems later on after he left Chicago. When the FBI approached “Romano” to continue to work with them, he was horrified to be labeled an informant and denied he ever met Roemer. Despite tremendous pressure from the FBI and the Justice Department, “Romano” refused to continue to cooperate. As a consequence, Roemer said he had to “suffer” consequences. “His life for all intents and purposes was ruined.”  While vague, one possible explanation is “Romano” was jailed for refusing to cooperate with a grand jury investigation. Roemer doesn’t state explicitly when “Romano” died but we can get an idea by reading between the lines in his biography of Outfit boss Anthony Accardo. In Accardo, Roemer writes that he and his wife were both deeply saddened when “Romano” died “recently” of natural causes. Accardo was published in 1995. This suggests “Romano” died in the early 1990s. It is significant that when Roemer released his memoir Roemer in 1989, he revealed that he had three high level informants within the Outfit but he only specifically named Richard Cain and “Sporting Goods.”  He didn’t mention “Romano” by codename. Roemer only alluded to him when recalled how his time was taken up by his two top informants – “Sporting Goods” and another unnamed informant (not Richard Cain). Roemer was vague about his help. He said that this unnamed informant had confirmed to him that Vince Solano had replaced Dominic DiBella as the boss on the North Side. It wasn’t until the publication of Accardo that Roemer identified this informant by his codename of “Romano” and provided more details to help form a profile. We are naturally led to ask, why did Roemer wait until 1995 to reveal the existence of “Romano”? Why didn’t he reveal his codename in Roemer like he did with “Sporting Goods”? Could it be that “Romano”, unlike “Sporting Goods”, was still alive in 1989 and Roemer feared for his safety? The profile that emerges of “Romano” is that of a high-ranking LCN member, close to Giancana and all the Outfit leaders, who began to cooperate in the late 1960s. He was likely present at the “Last Supper” meeting. He was friendly with Roemer and his wife, suggesting Roemer would have a somewhat positive view of him in his books. “Romano” may have spent time in jail or faced some other adversity, around the time Roemer left Chicago in 1978, for refusing to cooperate further with the FBI. He likely died of natural causes in the early 1990s. A few mobsters share some details that might match this profile. Outfit members John Matassa and Chuckie English were close to Giancana for years but both men were dead well before “Romano” is thought to have died. And neither man was present at the “Last Supper” meeting. Blasi was one of the few mobsters to attend Giancana’s funeral. After Giancana was murdered, Blasi spent eighteen months in Metropolitan Correctional Center for refusing to answer questions by a grand jury after he was given immunity. This is in line with what Roemer implied happened to “Romano” after he refused to cooperate any further with the FBI and suffered the ire of the Justice Department. An FBI report from 1976, may be the key to confirming the identities of “Sporting Goods” and “Romano.”  Written after the murder of Sam Giancana in 1975, the report is a “composite of information” collected from three “highly placed” informants associated with Giancana and organized crime in Chicago. The report, which was never meant to be made public, is noteworthy because it not only provides information about Giancana but also gives a brief description of the informants themselves. It seems more than likely that these are the same three “best” informants described by Roemer in his books. The report refers to an informant who lived and worked with Giancana through his period in Mexico before he was murdered, gangland-style, in December 1973. This is clearly a reference to Richard Cain whose cooperation with the FBI was recounted in Roemer. The second informant in the report is described as “one of the top half-dozen leaders of organized crime in Chicago for decades”. He was a top echelon criminal informant “until his [natural] death in July, 1976.”  The near-precise date of death and his high-rank in the Outfit will help us winnow down who this mobster might be. Les Kruse was an Outfit leader for years but he died in August, 1976, a month after the informant. John Roselli can be discounted because he was murdered in August, 1976. Dominic DiBella died in 1976, but he couldn’t be accurately described as a top leader of the Outfit for decades. And if we assume that this informant is “Sporting Goods”, we can also discount these three men for other reasons described earlier. The third informant referred to in the FBI report is described as a “prominent Chicago LCN member who was a close Giancana associate before 1966, visited Giancana in Mexico from time to time and who was very close to Giancana from his return from Mexico in 1974.” He is also described as “very close to Giancana for decades.”  The verb tense used to refer to him indicates he is still alive. Chuckie English and Butch Blasi, two long time associates of Giancana, both match this description. Both men were inducted LCN members, visited Giancana in Mexico and remained friendly with him to the end. And both men were alive in 1976, when this report was produced. But if we assume that this last informant is probably “Romano”, Blasi checks off all the boxes. Re-reading William Roemer’s books with an eye out towards Ralph Pierce reveals more information that could be construed that he was “Sporting Goods”. Pierce was assigned to Roemer by his superiors to develop as an informant. As a consequence, he got to know him well. Of all the mobsters Roemer encountered, he wrote that Pierce was the “guy I could talk to in the Outfit.”  He had “a sense of dignity.”  He was “very personable” and “affable.”  If Pierce was “Sporting Goods”, it isn’t surprising that Pierce is presented somewhat favourably by Roemer in his books. In a seemingly unrelated anecdote, Roemer recounted how Ralph Pierce had gifted Roemer’s brother baseball tickets after overhearing he wanted to attend a game. Roemer didn’t record any similar incidents of generosity from other mobsters. Was Roemer trying to make a connection between Pierce and “Sporting Goods” by way of their generous spirit? And if the Jewish Pierce was “Sporting Goods,” one seemingly irrelevant detail included in Roemer might make more sense. In recounting his regular Friday night meal with him, Roemer mentions that he abstained from meat and had the fish as Catholics were expected to do at the time, while “Sporting Goods” always had the steak sandwich. Was he trying to hint that “Sporting Goods” was non-Italian or Jewish? Why include that needless tidbit except as an inside joke? Butch Blasi had given up Sam Giancana once before. In 1963, Giancana revealed to the FBI in the heat of the moment that the entertainer Frank Sinatra was his personal conduit to the Kennedy White House. If he wanted to contact the White House, he went through Sinatra. This unnecessary disclosure was a massive error in judgement and was subsequently brought to the attention of the senior leadership of the Outfit by Blasi himself. Roemer tucked that away for future use: Blasi betrayed Giancana once, perhaps he would do it again? Reviewing other FBI reports in light of the assumption that Blasi is “Romano,” it’s possible to find other clues that tend to show he might be open to cooperating. In a 1964 report, Blasi had a friendly conversation with the FBI and said he would welcome another meeting, though he was careful to say that “I don’t know anything about the Cosa Nostra.”  Later, in another encounter in 1966, Blasi seemed to be warming up to discussing matters with the FBI, although he said he wanted to limit it to “me and me alone.”  The FBI report concluded that Blasi showed “a degree of cooperation” and that future contacts were contemplated. “Romano” is thought to have begun to cooperate soon after. Roemer never made clear why Ralph Pierce and Butch Blasi began to cooperate. He revealed no obvious motivation in his books, presumably because any reason would have led to their exposure. But, whatever the reasons, Roemer’s persistent dogging of mobsters and relentless drive to combat organized crime put him in a position to take advantage of the opportunities when they presented themselves. 1 William F. Roemer, Jr., Accardo: The Genuine Godfather, (New York: Donald I. Fine, Inc., 1995), 289. Born in 1926, Roemer served with the FBI for 30 years and was on the FBI's organized crime unit in Chicago from 1957 to 1978. He relocated to Arizona in 1978 and retired from the FBI in 1980, at which time he launched his writing career. He died in Tucson, Arizona, just before his 70th birthday in June, 1996, following a nine-month battle with lung cancer. 2 Accardo, p. 269. Roemer speculates that President Johnson shut down all electronic surveillance because he feared his associates might be compromised. 3 William F. Roemer, Jr., Roemer: Man Against the Mob, (New York: Donald I. Fine, Inc., 1989), 71-81. 5 According to Roemer, neither man wanted his cooperation to made public, even after he died. In a strange way, “Romano” never considered himself an informant despite revealing confidential Intel. 7 Roemer, 353. “Sporting Goods” cooperation was gradual. According to Roemer, he was still being developed as a source in 1974, when Giancana was deported from Mexico. This suggests that his full cooperation didn’t begin until about that time. 12 Why did “Sporting Goods” decide to go for dinner in the first place? Did he feel vulnerable during the upheaval that saw Sam Giancana deposed as boss and replaced with a succession of new bosses in the late 1960s and early 1970s? Was he looking for insurance with the FBI in case things went sour? The answer to those questions are still buried in FBI files. 19 Accardo, 267. Roemer believed Kruse when he declared he had never killed anyone in his life. 21 Roemer, 348. Roemer wouldn’t reveal the source by his codename of “Romano” until his book Accardo. But we can be confident that it’s “Romano” nonetheless, because he would have identified him as either “Sporting Goods” or Richard Cain if it was otherwise. 23 A photo of meeting was found at the home of one of the participants. 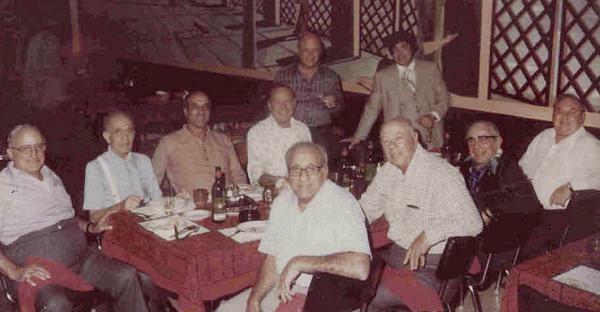 Present at the meeting: Tony Accardo, Joe Amato, Joe DiVarco, Turk Torello, Joe Aiuppa, Dominic DiBella, Vince Solano, Al Pilotto, Jackie Cerone and Joey Lombardo. Butch Blasi was said to have taken the photograph. 26 Accardo, 286. And another time, Giancana confided to “Romano” that he considered lying to prosecutors when he was given immunity in 1965 to appear before a grand jury investigating organized crime. Underworld confidences of these sorts could have hurt Giancana if they had gotten out. 30 Roemer seems to have built a mutual respect with “Romano” that led to a willingness to open up to him. But no one becomes an informant without a reason. What part did Giancana’s departure for Mexico factor into “Romano’s” decision to share? 31 Roemer doesn’t explicitly identify the informant as “Romano” but rereading the passage from Roemer in light of the revelations in Accardo, points to that conclusion. 35 Roemer, 343-347. Roemer writes that besides Cain, his time was taken up with “two of my top sources”. He identified one by his codename of “Sporting Goods” but describes the other only as a “source who was high up in the rank of the Chicago mob”. 36 Although Matassa was a former member of law enforcement, he was thought to be an LCN member. He was Giancana’s driver for a time. He died in 1976. English was a childhood friend of Giancana and one of his closest associates. He was murdered in 1985. 37 English wasn’t “Romano”, but there are indications he may have shared confidential information. 38 Solano died in 1992. Blasi died in 1993. 40 William F. Roemer, Jr., The Enforcer: Spolitro: The Chicago Mob’s Man over Las Vegas, (Toronto: Ivy Books, 1995), 33. 45 William F. Roemer, Jr., War of the Godfathers, (New York: Donald I. Fine, Inc., 1989), 219. The book uses some historical figures and real life events to tell a semi-fictionalized story. Roemer could be referring to Blasi when he writes that a source “spent time in the Metropolitan Correctional Center when the Bureau put pressure on him [to continue as an FBI informant]”. 46 FBI, Samuel M. Giancana, Chicago Office, November 30, 1976. NARA Record Number 124-10205-10086. The available report appears to have pages missing. 47 The word “former” used in this context usually means the informant is dead, but it can also be used to refer to a live informant who has stopped providing information. 48 Accardo, 374. Roemer misstates Pierce’s month of death as June of 1976; Roemer, 368. Roemer misstates Pierce’s death year as 1975. 49 www.myalcaponemuseum.com/id118.htm. Pierce died on July 2, 1976, of a heart attack that he suffered weeks earlier. 50 FBI, Samuel M. Giancana, Chicago Office, November 30, 1976. 51 William Brashler, The Don, (Ballantine Books, 1978), 313. 58 Abstinence from meat is not necessarily an indicator of religious/ethnic background. However, the remark could be a convoluted way of saying he was Jewish. 60 FBI, Samuel M. Giancana, Chicago Office, April 22, 1964. NARA Record Number 124-10195-10040. 61 FBI, Samuel M. Giancana, Chicago Office, September 16, 1966. NARA Record Number 124-10198-10120. 63 Accardo, 321. Blasi was spotted at Giancana’s home shortly before the murder. The gun that killed Giancana was found ditched on the route back to Blasi’s house. 64 Roemer may have felt an obligation, as his handler and friend, to protect Blasi despite the evidence against him. 65 FBI, Samuel M. Giancana, Chicago Office, Nov. 30, 1976. NARA Record Number 124-10205-10086. An informant thought to be “Romano”/Blasi said that “Giancana’s murder was not a Chicago mob contract, and that he believes the murder was accomplished by forces outside organized crime.” This was contrary to what an informant thought to be “Sporting Goods”/Pierce who said that Outfit leaders were upset with Giancana at the time for not sharing the profits from his rackets.